A great Aussie-style event of social networking and lucky draw prizes awaits those who want to hobnob with each other at the Australian-style buffet dinner with a fine selection of wine and beer. This month’s “Australian Flavour Sundowner” will be held at Blush Bar of Grand InterContinental Hotel on Teheranno, Gangnam-gu Seoul on Nov. 27 (Friday), 2009 between 6:30 p.m. and 9:30 p.m.
Glamour, sophistication and luxury are just a few of the words that could be used to describe the ambience of this stylish bar and lounge — Blush Bar. For the dinner an exciting buffet style menu of Australian inspired dishes will be prepared by Australian Nick Flynn, executive chef of InterContinental. The buffet menu will include such delicacies as prawn cocktails, grilled lamb cutlets, fish& chips, seared tuna with pickled ginger, rice paper rolls, lamingtons, and mini pavlovas. The dinner will be accompanied by fine selection of wines and beer. 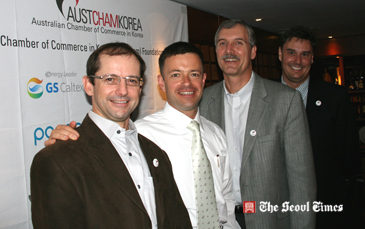 It will be sponsored by the Australian Chamber of Commerce in Korea (AustCham). Admission charge will be 50,000 won for members and 55,000 won for non-members (all inclusive cash/card at event).